Soon one of the environmentalist movement’s most important documentaries will hit the movie theatres. 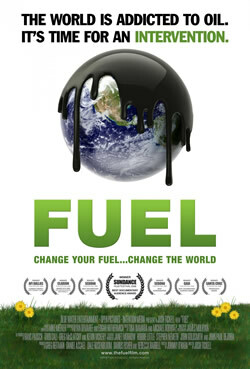 Fields of Fuel, a lively reality-style documentary about biofuels, that won the audience award at the Sundance Festival, opens in theatres in Oregon, Washington and Texas as of November 14th. The film addresses the future of biofuels made from waste and non-food feedstocks and produced in a sustainable way, as well as other aspects of how to present biofuel sustainability to the U.S. population. The storyline is engaging and links record high oil prices, global warming, and our demand for energy. The film exposes shocking connections between the auto industry, the oil industry and the government and also covers solar and wind energy. The film was one of the 3,624 feature length submissions to the Sundance Festival, of which 121 were selected for screening. It was one of two that featured an environmental theme. Cast includes Woody Harrelson, Willie Nelson and Neil Young. The story’s protagonist, Josh Tickell, drives around in a ‘Veggie Van’ and gives an in-depth account of how America’s addiction to oil eats away at its economy from the inside out both from a historic perspective and the current political angle. The people closely involved in the documentary’s making said that its storytelling format was a stroke of genius. “Without losing its conviction, it allowed each of us, expert or newbie, to find our own way with the material, united all along by the charm of the narrator and director, Joshua Tickell. It is a masterful film,” said award winning author Paul Hawken after attending the premier. Winning the audience award at Sundance (where the film had 11 screenings) also got it the attention of many newspaper editors, who invariably endorsed its main message: that biofuel based on food crops harm the environment and negatively impact global warming. Thanks for the comment and the correction on the mis-attributed quote. I’ll make the correction in the post.